Who you gonna call? Ghostbusters! I loved Ghostbusters 2 as a kid and I'd watch it every Halloween. I finally got around to watching Ghostbusters 1 last year to learn the back story. When Mindy Kaling wrote her first book she said wouldn't it be cool if they remade Ghostbusters with an all female cast, and what do you know it happened! I think it's really awesome to have a blockbuster movie where the main cast is all female and who are scientists. The movie will also have action figure dolls which is pretty groundbreaking considering it will be little boys playing with female action figures. 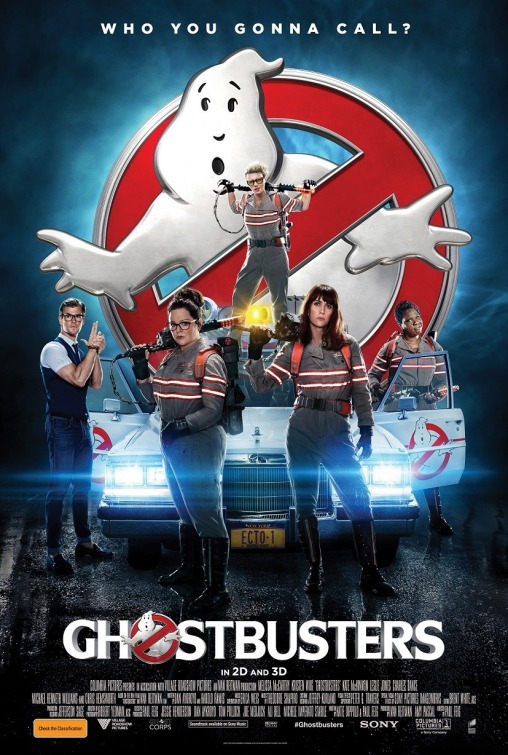 The storyline for the movie is following a ghost invasion of Manhattan, paranormal enthusiasts Erin Gilbert and Abby Yates, nuclear engineer Jillian Holtzmann, and subway worker Patty Tolan band together to stop the otherworldly threat. They hire the hot Chris Hemsworth to be their secretary. There were quite a few moments in the movie that had me cracking up laughing! At the end of its first weekend, it's number two in the box office so it did pretty well. You can expect to see cameos from the original Ghostbusters cast and your favorite ghosts Slimer and the Stay-Puft Marshmallow Man. A couple weeks ago Lyft brought the Ecto 1 car to DC and you could request a ride in it! Sadly I had nowhere to go those two days and missed out. Sad face. I just finished Bobby Brown's book and it reminded me of his cameo in the movie Ghostbusters 2 and his song for the movie "On Our Own." I must have watched the first Ghostbusters movie about a million times! I never got sick of it and still watch it today. Havent seen the second one yet... but hope to soon! I cannot wait to see this movie! I love the original Ghostbusters and even had my little one watch it and she loved it, too! I love the yellow dress on the left. ALL of these ladies are so funny! I loved Ghostbusters as a kid and I think I will love this remake just as much, if not more! I can't wait to see it! Love the cast in this movie! I am interested to see it after seeing the Ghostbusters originals so many times! I loved Ghostbusters when I was younger, and recently my boys fell in love too. I'm looking forward to this movie. I can't wait to see the new one! I think it looks like a blast, both my husband and I are excited! I thought the original Ghostbusters was hilarious. I can't wait to see the reboot! I love the fact that they used women in the new one. I can't wait to see this movie! I love the entire cast and have been obsessed with Melissa McCarthy since her Gilmore Girls days. I loved the old Ghostbusters and am sure I'll love the new one too! I had my kids watch the original Ghostbusters and they thought it was so ridiculous. Cant wait to see the ghostbusters movie. Love Melissa's dress too. Fair play to her for creating her own brand, sorely needed. I haven't watched the original ghost busters in forever. I wonder if my kids have seen it. I love that they chose to have an all-female cast because it's going to help empower young girls everywhere! I'm sure the action figures will be adored by little girls as well. I'm glad that people are loving the movie. I had the chance to screen this movie with the family and we loved it. It was so much fun to see these ladies battling ghosts on the big screen. I can't wait to see this movie. I haven't had a chance to make it to the theaters yet! The Ghostbusters car was at the car show I recently went to…I didn't even know it and missed out – what a bummer! I would like to see this movie when it comes out on DVD. This looks like it is going to be such a great movie. I can not wait to see it. I haven't seen the movie yet. I heard it's fantastic. I love that they did it with a female cast. I can't wait to see the movie. I loved both the original Ghostbusters and my boyfriend fills me in on everything to do with it. I can't wait to see the movie! I'm a huge fan of the original, and with a strong hilarious female cast, I can't resist. It looks fantastic! I'm iffy on seeing this movie. I loved the original so much. And while I'm all for the female cast, to me, I feel like there are some movies that are good as is. I love Melissa McCarthy's sense of style. Those yellow dresses that she wore are so stunning! I seriously cannot wait to see this film!!!! It's going to be pretty epic if you ask me. I saw the movie and it was awesome, I loved the female cast. Melissa looks lovely in yellow. I can't wait to see this one! Looks like a great movie.